Rep. Peter Welch, D-Vermont, was among nearly 100 Democrats in the U.S. House of Representatives who staged a protest Wednesday on the House floor objecting to a lack of floor debate or vote on gun legislation. Rep. Peter Welch, D-Vermont, was among nearly 100 Democrats in the U.S. House of Representatives who staged a protest Wednesday on the House floor, objecting to a lack of floor debate or vote on gun legislation. "We've got to consider common-sense gun legislation," Welch said in an interview during a brief break from the protest, which was led by Rep. John Lewis, D-Georgia. Through a sit-in on the House floor, Welch said he was standing up for an expansion of background checks for gun purchases. He also said he wants to block anyone on the federal government’s terror watch list from buying weapons. "We've had 30 moments of silence since Newtown, when those children were slaughtered in their school. And Orlando was the latest one," Welch said. "After each one of those moments of silence, it's followed by complete inaction. Congress does nothing. What you're seeing [in the protest] is just the reservoir of frustration that's being expressed by the American people, through representatives who are saying, 'It's time!'" Evan Hughes, the vice president of the Vermont Federation of Sportsmen's Clubs, an NRA state association, called the demonstration by House Democrats "political play." Hughes told necn he believes watch lists may have errors on them that could block innocent gun buyers. He also argued someone determined to cause harm could simply dodge a background check. Welch vowed to continue pressing the issue, until the House majority leader, Paul Ryan, R-Wisconsin, brings gun legislation to the floor. The Associated Press reported that Ryan said House leaders were "waiting to see what the Senate does before proceeding" on gun legislation, including a possible compromise that Sen. Susan Collins, R-Maine, is seeking. 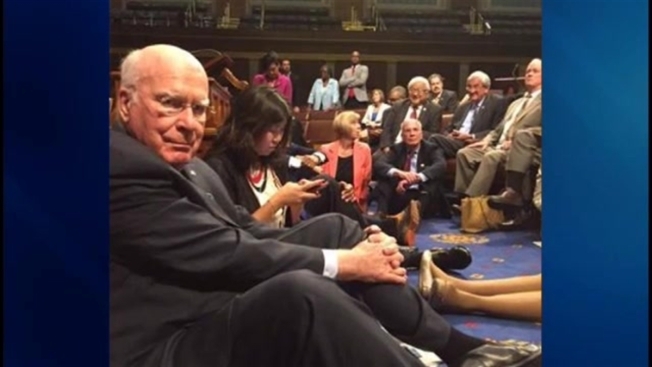 Several Democrats from the U.S. Senate, including Sen. Patrick Leahy of Vermont and Sen. Jeanne Shaheen of New Hampshire, showed their support for House colleagues participating in the sit-in.Rep. Peter Welch of Vermont was among the Congressional Democrats participating in a sit-in on the House floor WednesdaRep. Peter Welch of Vermont was among the Congressional Democrats participating in a sit-in on the House floor WednesdayRep. Peter Welch, D-Vermont, was among nearly 100 Democrats in the U.S. House of Representatives who staged a protest Wednesday on the House floor, objecting to a lack of floor debate or vote on gun legislation. Several Democrats from the U.S. Senate, including Sen. Patrick Leahy of Vermont and Sen. Jeanne Shaheen of New Hampshire, showed their support for House colleagues participating in the sit-in.